Keeping Current Matters (KCM) is an eight-year-old company, based in New York, that provides educational content for real estate agents, to keep them informed on current housing trends. In return for a monthly fee of $19.95, KCM researches the market and compiles relevant information into concise 30-minute presentations that agents can use to educate both themselves and their clients. The company also produces quarterly guides that speak directly to consumers, letting them know what to consider when buying or selling a home. Agents can use the guides as lead magnets or as a drop-off piece when visiting clients. KCM’s customers aren’t the average run of the mill agents but those who treat real estate as a business, actively pursuing listings, leads and sales. Those are the ones who want to stay current on trends and who appreciate the work KCM provides, Harney said. Harney’s father, Steve, a successful real estate broker with 35 years of experience, started KCM after selling his 550-agent firm in 2007, just before the real estate market crashed. As the company grew, Harney’s father realized that he was limited in the number of speaking events he could conduct and that, to impact more people, he would have to transition to a new business model. At that point, Harney’s father made two decisions that would forever change KCM’s direction and future: He took the business entirely online and invited his son, Bill, to join the company and produce educational content for real estate agents. The company has experienced a track record of sustainable growth since its founding, which Harney attributes to hard work and excellent customer service. In 2011, KCM began using the marketing automation technology platform Infusionsoft for its marketing and sales. Harney had come to the realization that, just as his father was limited in the number of people he could reach by speaking, that “selling from the stage” was also not scalable. Harney confessed that a steep learning curve was involved in using the platform and that the first year proved difficult. As Harney and his staff learned the platform’s ropes, growth occurred at a faster pace — 40 percent year-on-year for three years running. This year, 2016, the company plans to expand by another 50 percent. Not only has Infusionsoft been instrumental in KCM’s growth in providing educational content for real estate agents, it is also vital to the company’s very existence, according to Harney. 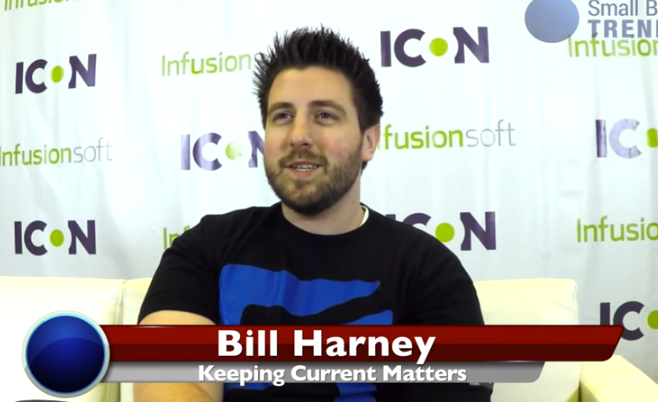 Harney describes Infusionsoft as an additional employee and the company’s marketing backbone that costs less than having to pay a real person. When asked if he had any advice to share with other business owners, Harney’s encouragement was to keep things simple. Harney also advocates for simplicity in the use of marketing technology.